Piston valves function by a piston which moves in a cylinder. The movement of the piston serves to open or close the valve. The Piston has a hole through it. As the hole moves up and down, the valve is opened and shut. Piston valves can be used in media such a steam, water, compressed air, etc. 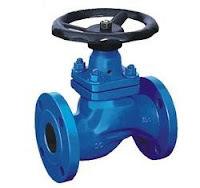 The valve can be mounted in the vertical or horizontal direction. The valve has a handle which is to be rotated. The rotation causes the piston to move in a linear direction. Piston valves are also to be seen in musical instruments.